PRICING, TERMS & CONDITIONS ARE NON NEGOTIABLE. 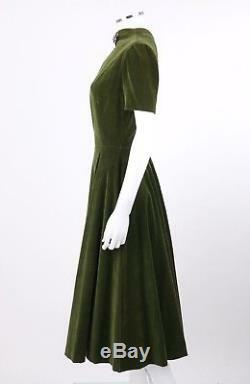 1950's green velvet party / cocktail dress. Short sleeves with lightly gathered shoulders. 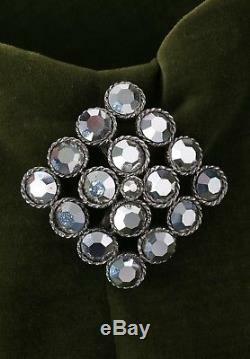 Removable silver rhinestone diamond shaped brooch at center front. 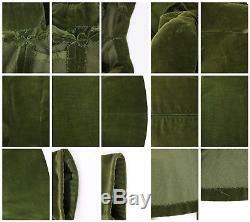 Princess seams for contoured fit. 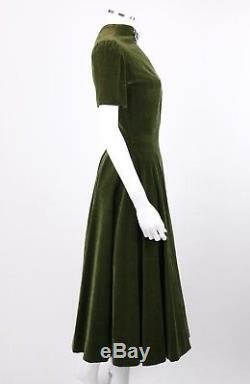 Short v neck at back. 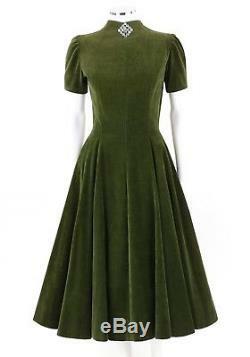 Fully flat lined in green tulle. There is no size label, but this. Appears to fit like a current. Measurements are provided as a courtesy. Since everyone measures differently, all of our measurements vary and we offer only approximations. 14.5 (seam to seam). 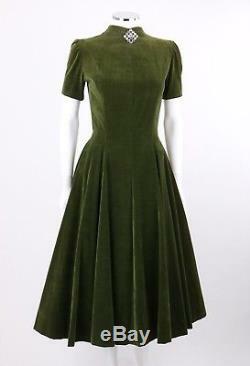 8.5 (shoulder seam to cuff). Full (measured 6 below waist). 44.5 (center back to hem). Contact information for our retail store can be found through eBays Ask a question option under the Pay for item section. We will not mark any parcels as gift or falsify costs or contents. All of our terms and pricing are in place for a reason and are not negotiable. We do our best to properly and accurately describe each and every item, but there are variations in how people view, interpret and notice condition, alterations, measurements, etc. On some items it is near impossible to mention every imperfection and for this reason our listings include multiple photos of each angle of our items for sale. The pictures are part of the description and condition report. We do not clean or treat any of our garments. We are careful and selective of the items we sell according to their condition / cleanliness. Everything in this world has a scent, which varies by age, storage and prior use. Unless otherwise stated our items are not new or factory direct. We sell only authentic items and authenticate every item prior to it being listed. Thank you for your trust! 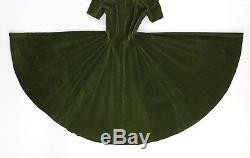 The item "Vtg COUTURE c. 1950's Green Velvet Circle Skirt Party Dress with Rhinestone Brooch" is in sale since Thursday, June 7, 2018. 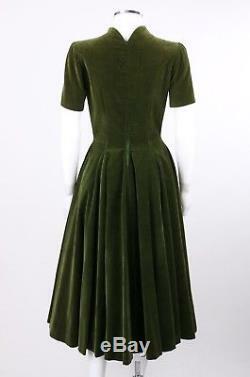 This item is in the category "Clothing, Shoes & Accessories\Vintage\Women's Vintage Clothing\Dresses".resale" and is located in E-COLLECTIQUE. This item can be shipped worldwide.